As they reached a good enough height, they caught a glimpse of two other dragonfly’s, one was in a bit of trouble but seemed to be ok. The other seemed to have a team of 8 with three pea shooters. Squinting, she thought she caught a glimpse of ‘nah’, she thought, ‘it can’t be’. “Sally, Jane. I think you are the best riders any Dragonfly has ever had.” Haley Stargazer set off at some speed as soon as the race started. Easily going into the lead, they had one goal. To beat the other teams to the door at the other end of the lily pond as fast as possible. Sally was the perfect rider. A bright girl in her mid twenties with short cropped blonde hair, freckled fresh face and blue eyes, she raced cars for a living and knew how to fly. Interestingly, Jane was the perfect gunner. an intelligent, fresh faced girl with yellow eyes in her mid twenties, she was a champion shooter for her country. Together, they knew before they started they would be a formidable team. 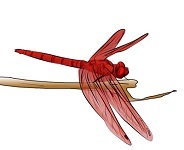 Haley added to their amazing skills by being one one of the fastest dragonflies there ever was. Who could possibly beat them? “Roger that Sally.” Haley was so happy to have a team that knew exactly what they were doing. It filled her confidence and she couldn’t hide the grin on her face when she saw the other Dragonfly’s in the distance. Jane really was all Sally said she was and Sally herself just knew every moment to turn and how to avoid all attacks. Sally was loving her role like she was born to do it. She simply couldn’t miss and even managed to take out 1 bird and two frogs with one shot. The last thing they expected was a bird leading the attack from afar. The bird in question was a magnificent specimen, twice the size of any other in the flock, he had command. Coordinating attacks and re-positioning his flock in the best positions to destroy the dragonflies. Watching from his perch, he could see their strategy and determined they would be his kill. He called to his four best fighters in that specific way that told them who to attack and where to go. Jane, Sarah and Haley heard the call and looked up, but couldn’t see anything and carried on. The birds he called broke away and took up positions a little further based on Haley’s trajectory. The intention being to herd, rather than attack. All going well, and it usually did, the trio would end up falling down the commander’s neck with ease. The herding began when the first bird made itself known to the team by flying directly above them at an angle that couldn’t be reached by the pea shooter. Matching speed and precision, he was there to let them know they couldn’t go up. The team sensed the bird attack was imminent. Sally had an idea and whispered it to the others. She could sense this was the start of the attack and that they may well be herded about before it happens. “err. Sally?” Jane said. “There’s another to our right doing the same thing. I can’t get the angle on either of them.” Sally looked right and saw the bird flash it’s beak at them. Looking back, suddenly, there was a third bird with it’s Beak open in front of them. “WOAH!! !” Banking hard left she managed to avoid the bird by centimetres. As she did so, she was then met with a fourth bird, beak open, ready to accept them as a meal. “WOAH, blimey. They’re really pushing out the stops here!” She said as she narrowly avoiding the bird. Sally waited another second, then shouted “NOW!” Haley did an emergency stop, allowing Jane the angle on all four birds surrounding them. It took one shot each to take them out. “Now Haley or we’re sitting ducks!” Haley put on the speed and Sally banked hard right, then left, avoiding some reeds. Then went up at a tremendous rate. The idea being to get a quick look at where they were and to angle downwards straight at the door. The commander though had seen this before and was waiting. As they climbed, they caught a glimpse of two other dragonfly’s. One was in a bit of trouble but seemed to be doing ok. The other seemed to have become a bus with 8 people and three pea shooters. Squinting at the people on the bus, Jane thought she caught a glimpse of ‘nah’, she thought, ‘it can’t be’. With Sally knocked out only Jane was able to do anything but she was stuck in the gunners chair and the spinning meant she couldn’t get a good aim. Haley did the best she could to straighten up out of the spin and Jane looked intently at the sky around her, trying to find their attacker but he was too fast. ‘BAM!’ Haley was hit this time on her underbelly. Breaking some of the straps holding Sally and Jane in place. Sally, still unconscious had no idea she was now dangling dangerously away from Haley. “Jane?” Haley said worried. Before Jane could say anymore, Haley released the straps and flew in the opposite direction as best she could. Jane looked up in the direction Haley went, just in time to see her being swallowed whole by a giant bird. She then watched as the bird looked down at them as if debating whether to eat them too, then seemed to think better of it and landed on the branch of a nearby tree. Just as Haley said, they landed on soft grass right in front of the exit door near a bank of the pond. Jane unstrapped herself and went straight over to Sally. Still unconscious, she checked and noticed she had a gash in her head. The bleeding had stopped but it didn’t look very good. Sally unstrapped Jane, dragging her into a clear patch of grass. Using some of the strapping, She made a makeshift bowl, went to the lake and filled it. She pulled a couple of leaves from one of the pond lilies, using them to clean Sally’s wound. She then filled the bowl again pouring the water over Sally’s head, waking her up, coughing and spluttering. “wha.. What the..” She was not impressed. Hearing this, Sally sat up and looked around. “Where’s Haley?” She asked. “oh no…” Was all Sally could say.